I went down to Somerset at the weekend with my mother and fiancé (I still can't get used to calling him that) to visit family and check out both the church where we'll be getting married and the reception venue. They are both everything I could have wanted and more. I may have missed mushrooming season, but visiting Somerset at the tail end of October still has its advantages - my uncle had a surplus of apples which unlike cooking apples, won't last the winter. So my mother and I returned to London with bags of beautiful pommes. While hers were earmarked for apple crumble, I decided to try making a tart with mine. I am spectacularly lazy when it comes to all things baking related, so I used bought puff pastry - I don't think I could make it as good myself as I don't have the patience and will never make a pastry chef. Having had a second slice for breakfast, I can reassure you that it is as good cold from the fridge as it is hot out the oven! If you're using frozen puff pastry, leave it out to thaw. Meanwhile, make the apple purée - peel, core and roughly dice two of the cooking apples (place the peeled and diced chunks in a bowl of lemony water so they don't brown while you peel the rest). Melt the butter in a saucepan, then add the apples, brandy and cinnamon. As the apples can be quite tart, once the apples have softened to a paste, taste and add as much or as little sugar as you deem is necessary. I used about 50g as my apples were really quite sharp. Transfer to a fridge-friendly dish and leave to cool. 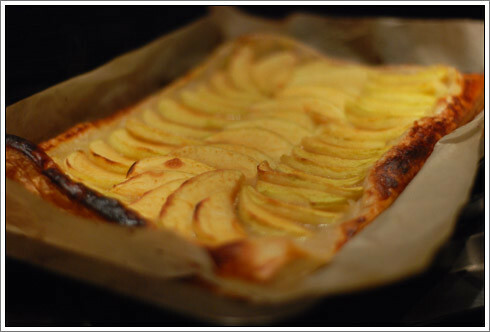 Once the apple purée is cool, preheat the oven to 200°C then place a sheet of baking paper on a baking tray and lay the puff pastry sheet flat on it. Spread the puree on the pastry, leaving 1/2 an inch clear around the edge. Cover and place in the fridge while you prepare the top layer of apples. Peel, core and thinly slice the remaining two apples (again place the peeled and diced chunks in a bowl of lemony water so they don't brown while you slice the rest), then remove the pastry from the fridge. Place the apple slices on top of the purée, beat the egg & brush onto the exposed pastry around the edge, then dust the icing sugar over the apples. Bake in the oven for 15-20 minutes, until golden. Leave to cool for 5 minutes then cut into slices and serve. Delicious with a scoop of ice cream or spoon of crème fraîche. Perfect!